In May we celebrate the Crosses festvial but this month is especially lovely in Andalusia as Oranges trees waft the scent of orange blossom through the air. Plants and flowers all are lush and green. The weather begins to get warmer and days are longer. Straight after Easter the Festival of the Crosses of May comes along on May 3rd. Some villages and towns celebrate around the May bank holiday, 1st May. This festivity reminds me of the traditional well dressings in Derbyshire. It´s not clear how this festival originated in Spain. It is probable that Pagan May Day celebrations influenced this festivity. 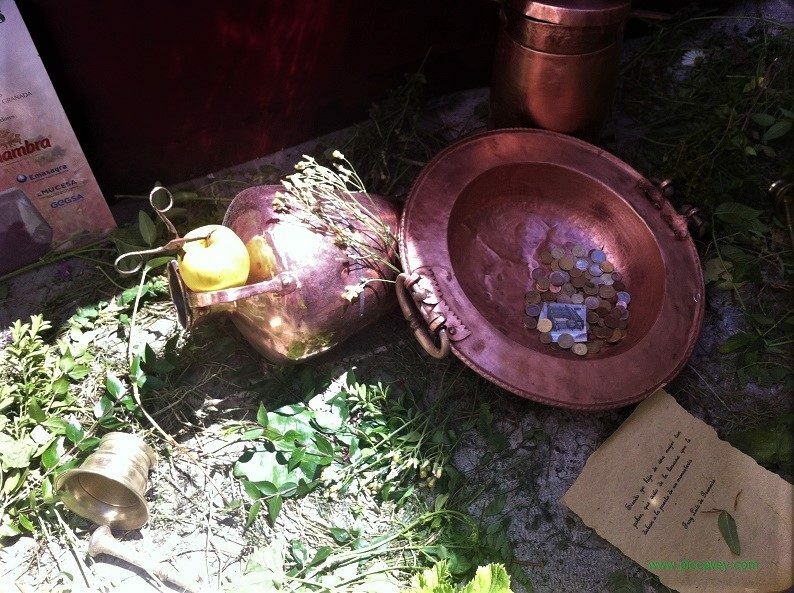 Some May celebrations also date back to Roman times. Some theories trace back this tradition to the middle ages. When Jesus Christs cross was found by Saint Helen. Also known as the True Cross. The actual date in the liturgical calendar is the 14th Sept which is when Holy Cross Day is observed by the Church, yet the Crosses of May are celebrated on 3rd May in Spain and some other countries. In Andalusia you can find crosses in all of the provinces. I can highly recommend the Crosses in Almeria, Granada and Cordoba especially I have visited these ones myself. 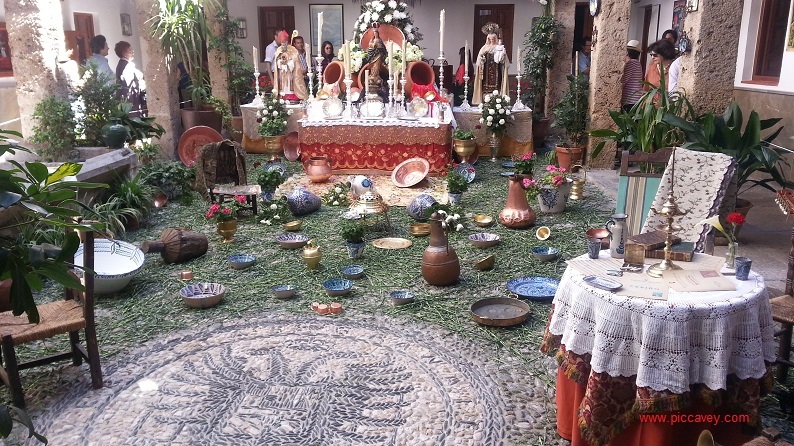 This tradition spreads across all of Spain and even in some South American countries too. You will see them in some locations in Valencia Toledo and Alicante provinces too. 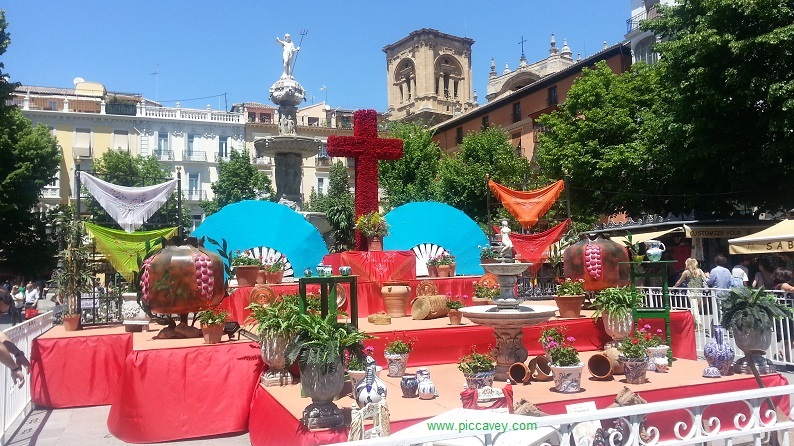 In Cordoba the Crosses of May celebration is combined with the Cordoba Patios competition. 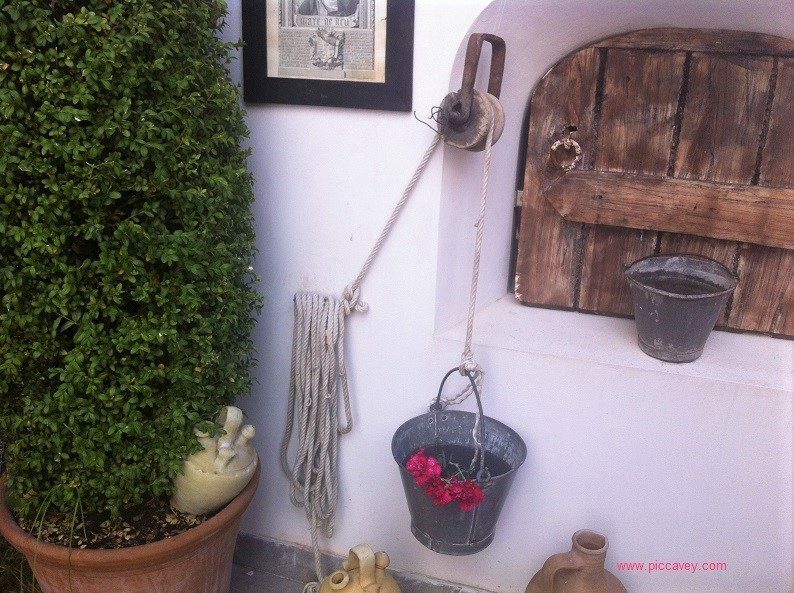 Usually 25 crosses take part and over 50 patios are decorated with ceramic painted plant pots and brightly coloured geraniums and spring flowers. In 2012 the festival runs from 2nd to 13th of May. You can also head to Jaén or Ubeda where the festivities are also popular. In Malaga and in Almeria the crosses are located in places around the city centre. In some larger towns there can be over 40 different ones to see. They are easy to locate as there are always people around them. 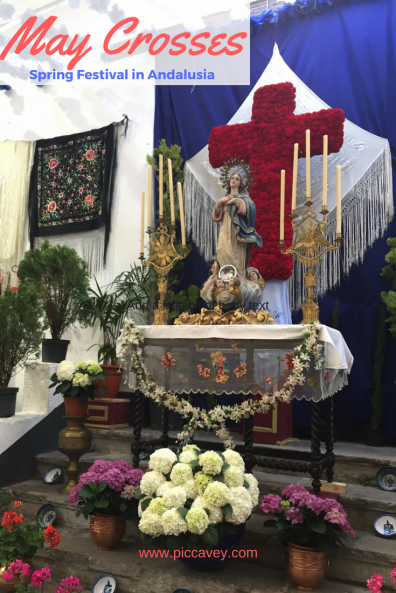 In Cádiz the crosses are celebrated with evening verbenas and often patios are decorated in flowers also in nearby El Puerto de Santa María across the water. 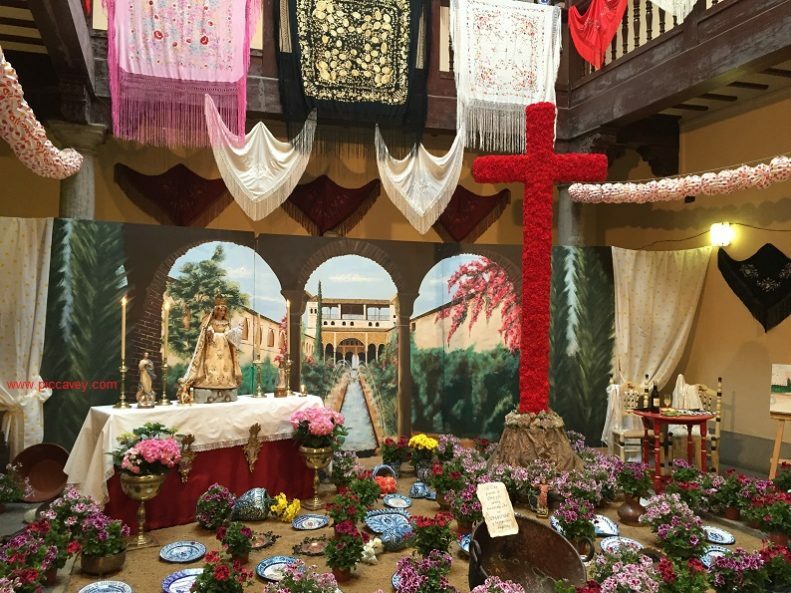 The Cruz de Mayo of San Pedro in Huelva is notable but there are others in Huelva province such as Rociana del Condado or in Bonares. 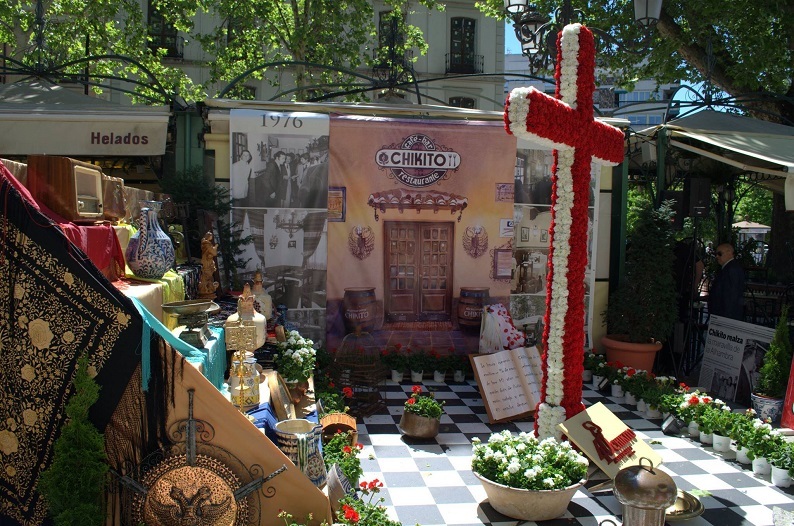 In Seville the festival is still celebrated and in nearby Ecija where the children carry crosses along in processions. 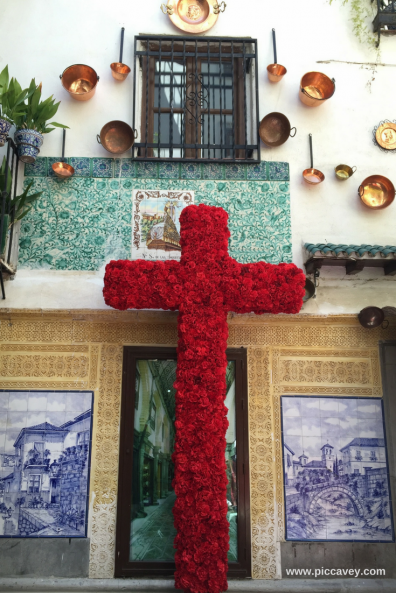 In Granada the city has around 100 crosses set up around the different squares and patios. There are also events happening for on the weekend next to the 3rd of May. A competition is run by the town hall for the best cross display. There are also decorated balconies that are awarded prizes too. There are often culinary activities and of course there´s dancing and singing too. 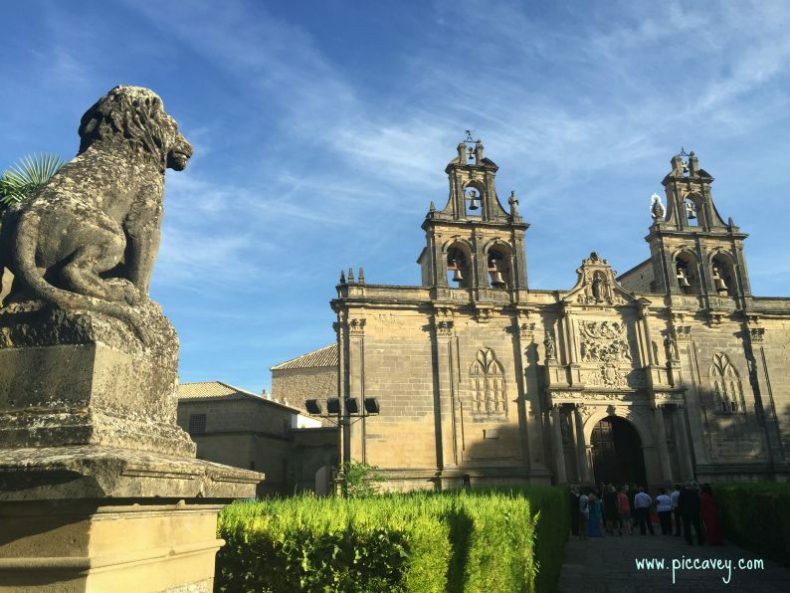 The Albaicin and Realejo are good areas to see the crosses, as well as the historic city centre. Traditional food such as migas and broad beans are typical and Sevillana dancing or Rocio choirs can be spotted around the city too. Sometimes you see children dressed in typical Andalusian dress. They have a small portable floral cross. Boys wear striped trousers, braces and a cummerband and a Cordobes hat, girls wear flamenco style dresses and flowers in their hair. They ask for money (like penny for the guy in UK on bonfire night) they say Give me a Chavico for the cross, the chavico is an old name for a small coin at the beginning of the 1900’s. Other places to check out the crosses in Granada are Almuñécar, Armilla which is just outside the city to the south, Baza and Motril. In Motril which is a sea port, the festivities coincide with the Feria Chica (Little fair) and are declared National Touristic interest. 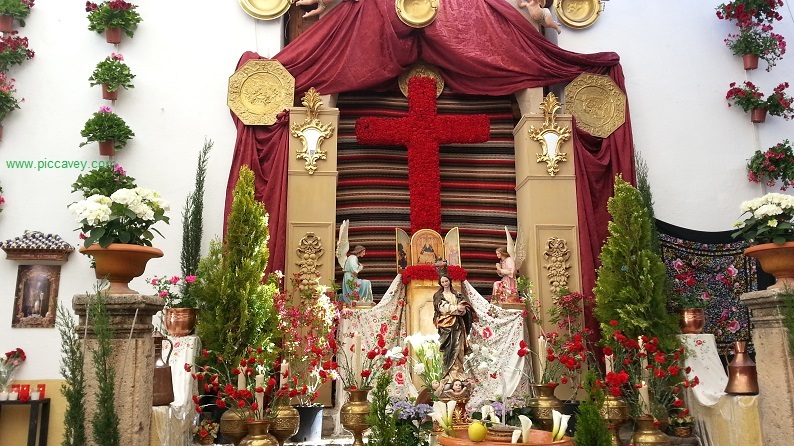 The crosses are usually quite tall and are decorated with red or white carnations or a mixture of flowers. They include local ceramics, embroidered shawls, shiny copper pots, candles and anything representing the local traditions. Adorning the area around the cross in an eye catching display. As this is a competition, naturally the onlookers comment on the flowers and the design of the display. Don´t miss the apple right at the bottom of the display. This apple has scissors sticking out of it. This is to avoid people gossiping and saying ¨it´s really nice BUT they could have made it bigger, the flowers could have been prettier….¨. The explanation behind this is that the apple is also known as ´pero´ in Granada (from peral) . The would refers to both the fruit and the word but in Spanish. So it the scissors cut the ´but´ there are no buts. People can´t criticise the cross display as it already has the but there. I understand that this maybe difficult to comprehend if you dont speak Spanish. In the Valley of Lecrin, in the village of Pinos del Valle they celebrate a week of fiesta for the Crosses of May, they are dedicated to Santo Cristo del Zapato (Christ Saint of the Shoe….yes really) The celebrations include activities for children, firework displays, bike rides and chocolate with churros. Then there dancing in the evenings on the village square, great if you like to dance tango or the Paso doble ; ) One main festival day they make a huge Paella for all the neighbours probably over 1200 people and everyone has lunch together outside.There are processions around the village with a marching band and majorettes. Cars and tractors pulling carriages decorated with crosses and flowers make up part of the procession. The women wear typical flamenco style dresses and it´s a colourful display to see, welcoming the Spanish Springtime. Often there are firework displays which close the weeks festivities but in the daytime to accompany the procession there are often bangers or rockets to make sure you know that there is something going on. In Granada city years ago there would be bars set up along the streets. Close to each Cross, usually organised by each group of neighbours. This was regulated by the authorities and drinking on the street wasnt allowed now during the week of the crosses festival for several years. In 2018 the bars will be closely controlled (for noise and anti social behaviour) but will be set up in certain city centre locations. 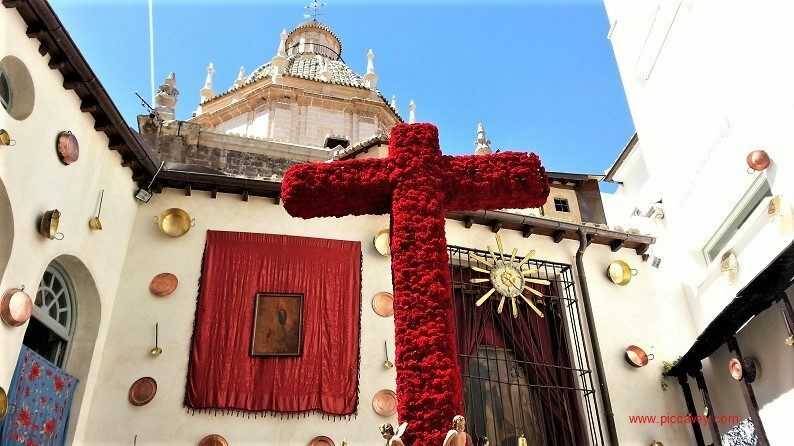 There is a busy atmosphere around the city with people having tapas and beers while walking around to see the crosses displayed around the city. It is a fun and colourful week in Andalusia. Great post Molly. Really enjoyed reading this after seeing all the crosses. 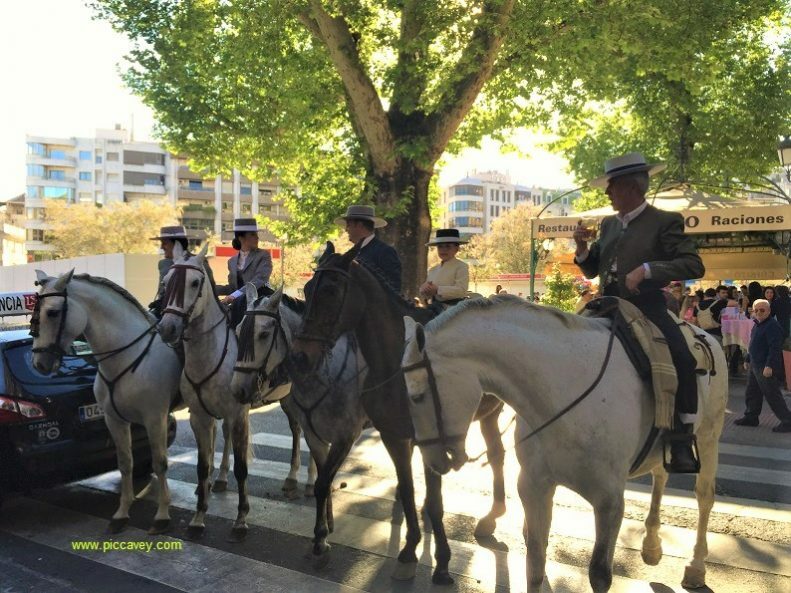 We were in Ronda and Granada last year for these festivities and it was spectacular and so much fun. Hopefully we’ll be back next year!